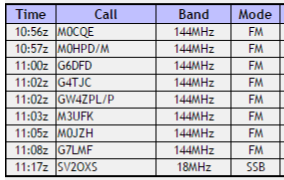 M0PLA/P SOTA Activations: 11th March 2017. GW/NW-049 SOTA Activation visit. GW/NW-049 Gyrn Moelfre. 11th March 2017. Grid SJ 184294. Altitude 523M. Today's revisit to Gyrn Moelfre after our last activation on New Years eve 2016, We parked at the same spot next to the church yard GD SJ 181303. The main difference on this trip, we both now had two walking poles each, last weeks summit we had one pole each and after reading a few other Sota blogs everyone seamed to agree two poles is better. Well the answer to that is YES it made the ascent easier (this is a hard climb anyway mostly very steep). We followed the green route, a slightly different route than last time to see if it was any easier, I don't really think it was. As seen on the above photo's most of the ascent is steep. We took 40 minutes to reach the summit then set up camp. As usual Jamie set up the 2M dipole and for this activation I had made a 17M dipole to try, after last weeks attempt of activation on HF and wall to wall contest stations. I had one contact to Greece (it works) but the band was very quiet. We had 8 QSO's on 2M and 1 on 17M, the weather was not too bad and the wind had not really been a problem, all in all a pleasant morning out. We started our descent at 12:10 p.m. after lots of CQ Sota call's on 18.131 Mhz. Maybe another day might be better. We made it back to the car in 30 minutes and started our journey home.